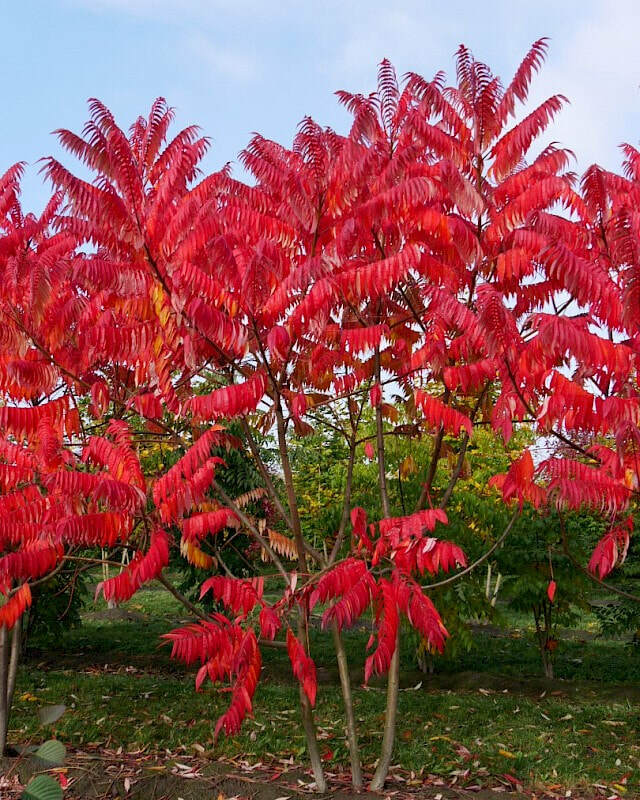 Rhus typhina ‘Laciniata’ is an interesting large flowering shrub / small tree native to North America. Commonly know as Stag’s Horn Sumach, Rhus is widely recognized in the UK, since in was introduced in the early 17th century. Sumach flowers during late spring with large candle shape yellowy green flowers set of brilliantly by the bright red young stems. During late summer, clusters of fruit appear, ripening to a red colour by autumn and often lasting on the tree throughout the winter. In autumn, the bright green tones of the foliage give way to a brilliant array of colour, from red through to orange and yellow. ‘Laciniata’ is a female form with deeply incised leaflets which create a fern like effect.